Seminar of Democracy House of Georgia. 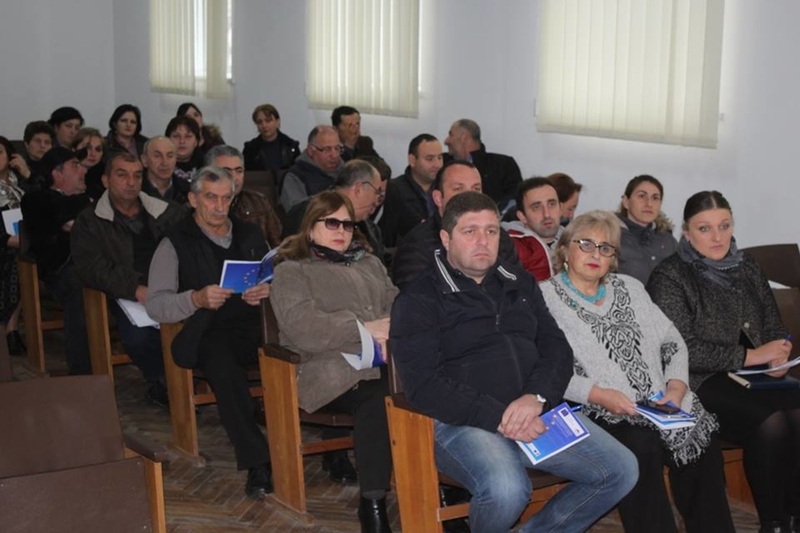 “Democracy House of Georgia” organized a seminar in Khoni, on December 12, 2018 under the framework of the sub-granted project “Informing SMEs and Local Self Government about DCFTA”. Local members of the municipality, local SMEs, business operators and other stakeholders attended the event. Seminar was generally about EU-Georgia Association Agreements with the special focus on DCFTA. Seminar concretely covered the issues like exporting the goods on EU market without customs tax. There was also discussed the exceptional cases such as quotes on garlic and its prices to enter the market. Apart from this, the attendees drew attention on anti-counterfeiting mechanisms, phyto sanitary norms and trade barriers in general. Participants discussed what type of product could be considered as exclusively Georgian. Moreover, they also had some comments of SME Development Strategy 2016-2020. Organizes distributed project brochures, calendars and pens to the seminar participants. Overall 55 people attended the seminar, out of which 23 were women.